Shown with optional colored handles. 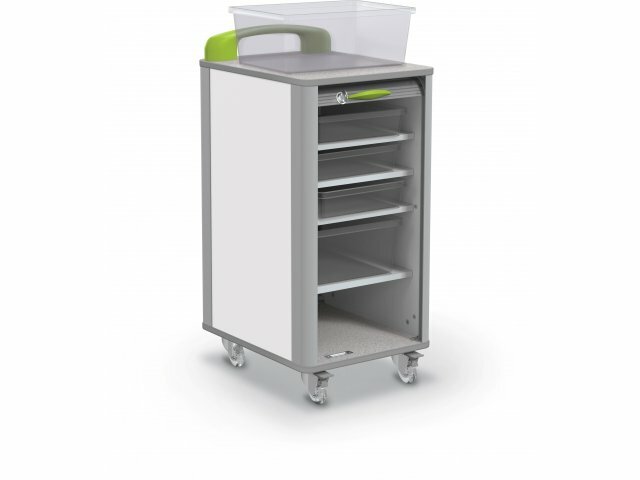 This convenient mobile makerspace cart is designed to fit right underneath a Balt Makerspace table or podium, to save space when not in use. It includes five clear plastic tubs with lids, which make it easy to stay organized and find tools and supplies as needed. Your students are free to create, explore and innovate with Balt Makerspace Furniture. Whether you have a dedicated maker studio or move materials between classrooms, this collection lets your students tinker and build in any space. Commercial-quality skate casters facilitate smooth rolling for effortless setup and transitions. With the amount of time, thought and energy that students put into their creations, you want to ensure that supplies and prototypes are properly secured. 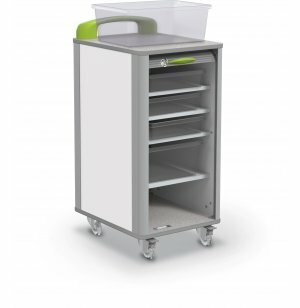 Makerspace carts have tambour doors which protect materials and accessories, while they are stowed away between lessons. Their adjustable shelves allow you to maximize space, by facilitating a perfect fit. Ergonomic handles support easy steering to get things where they need to be as quickly as possible. Space Saver: Designed to dock under a Balt Makerspace table, with a small footprint. All Inclusive: Includes five clear plastic tubs (2 large, 3 small) with covers, so it's easy to find tools and supplies. Attractive Handles: Carts come standard with black handles. Colored handles are optionally available. 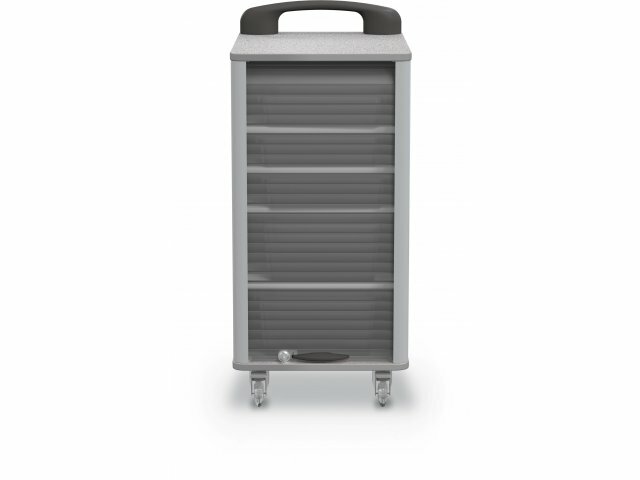 Full Collection: With a selection of carts and tables, you can outfit a full makerspace in convenient, coordinated style. Sleek Surfaces: The low-maintenance, high-pressure laminate exterior with ABS banding is easy to clean. Smooth Rolling: Rolls on four commercial-quality, 3" skate casters (two locking).